Golf is a maddening game usually made more sane by unspoken empathy between opponents. It is this spirit that helps make it the envy of many a sport. This is why Matt Kuchar is feeling the heat for doing nothing wrong according to the rules of the game. His crime was contravening its spirit during his quarter-final win over Sergio Garcia at the WGC Match Play in Austin, Texas. As Garcia acknowledged, the primary fault lies with him. He hot-headedly raked away his ball before what should have been the most straightforward of concessions on the seventh hole last Saturday. It was an unprofessional, silly error. But in golf there lies an unwritten code where you look out for one another without diminishing in any way the competitive edge of a match. It is why, for example, we help look for each other's lost balls. And when that convention of co-operation is compromised it raises eyebrows. This was the case when Kuchar chose to alert the referee to the fact that he had no time to concede the tiny putt that his opponent had carelessly raked towards the hole. Garcia's initial miss gave the American a fortunate half. The Spaniard's petulance then turned it into a loss. But who wants to win a hole in such circumstances? There are many instances when an opponent's frustration leads to the player hastily picking up a narrowly-missed putt in matchplay. The way to deal with it when the ball is in concession range is to swiftly say "that's fine". Kuchar should have been on hand to do exactly that. Why was he so far detached from the action? Sympathy for the American drained when he acknowledged that he had spoken to an official. Kuchar revealed: "I said, 'Sergio, I didn't say anything. I'm not sure how this works out.' I didn't want that to be an issue. "So I asked [the referee]. I said, 'Listen, I don't know how to handle this, but I didn't concede the putt. Sergio missed the putt.'" Kuchar told Garcia that he did not want to win the hole in such circumstances but was unwilling to do anything to redress the balance. Fair enough, but why did he feel the need to involve the official? Neither player covered themselves in glory through this episode but the US Ryder Cup man's reputation took the bigger hit. As Tommy Fleetwood's caddie Ian Finnis tweeted: "What a joke!! 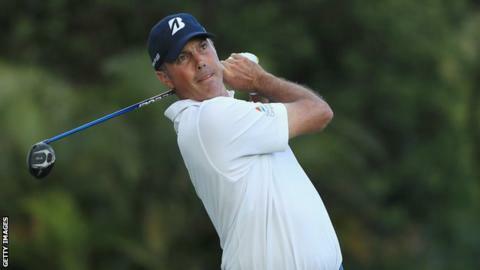 Kuchar showed no class there." And Lee Westwood noted it "could've all been avoided without even coming into the public domain". Both players did not need this after recent high profile PR scrapes. Garcia was disqualified for disgracefully vandalising the greens in Saudi Arabia, while Kuchar was perceived to have short-changed a stand-in caddie in Mexico last year. They have each sought to repair the damage but last week created the biggest talking point from what was a curious matchplay that rather fizzled out over the weekend. A final between Kuchar and eventual champion Kevin Kisner was the sort of showdown craved only by fans of Line of Duty. It was not the match-up to compromise plans for watching the start of series five of the BBC TV hit. Even with the relatively new round-robin format, the tournament offers no guarantees that the genuine marquee names make it to the final day. And when there is so little Sunday golf to show it makes for pretty pedestrian viewing. The time has come to return the matchplay in its old sudden-death format in tandem with a women's knockout tournament at the same venue, with both genders sharing TV airtime. It is logistically possible and surely major companies, most of whom put diversity at the heart of their corporate strategies, would want to get on board with such an idea. Plus there would be more golf to show come the Sunday matches. The notion of combining men's and women's events is growing in momentum, as we see with this week's Jordan Mixed Open. It features pros from the Ladies European Tour, the European Challenge Tour and seniors' Staysure Tour. I am not sure about the concept of them competing against each other off respective tees. Setting up a genuinely fair course at the Ayla Golf Club for each constituency is a huge challenge. However, it is a refreshing, forward-thinking idea that should be applauded for attempting to break new ground for the game. Less appealing is this week's introduction of the Augusta National Women's Amateur. Not because the home of the Masters is staging female competition for the first time but because the timing stinks. This new tournament for elite female amateurs clashes with the ANA Inspiration, the first major of the year. This should be the women's event commanding most attention but it will not because of the Augusta competition. Once again the sport is guilty of disjointed scheduling to its detriment. If the Georgia club wants to promote the women's game, then do it properly with their own version of the Masters. That would be the product of a sensible, sane strategy for golf's future. But the ethos that drives the sport would have to change and, as we know, the spirit of golf can become compromised in all sorts of ways.